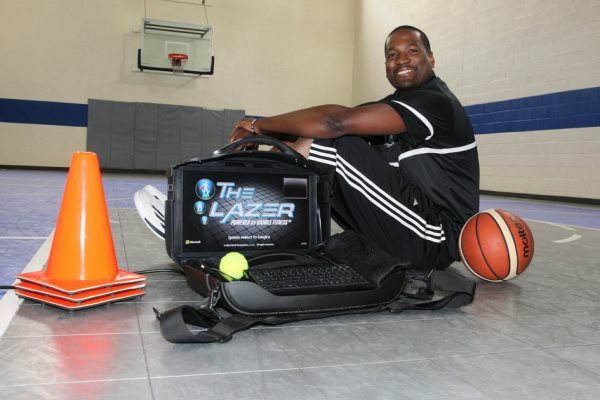 Inventor Curtis Smith with his Lazer 900 machine. AFRICANGLOBE – Curtis Smith’s career didn’t start on a basketball court. It began with a candy bar. Smith’s first rejection in the business world was bittersweet, and it certainly wasn’t his last. But through it all, a positive outlook and persistence paved the way toward his latest invention: The Lazer 900, a machine that trains basketball players in their ball handling in an unconventional way. And that’s exactly how Smith envisioned it: unconventional and innovative. 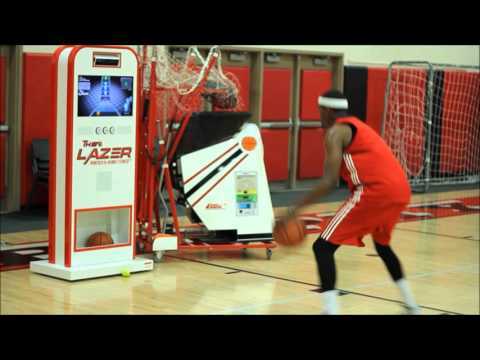 The Lazer 900 displays dribble moves on a screen for players to mimic, much like the once-popular video game “Guitar Hero” had players mimic the notes as they came rolling forward. Smith’s machine poses a much greater physical challenge, though, invoking the use of a basketball, tennis ball, cones and more. It’s traditional basketball training blended with the digital age, and it’s on the rise. Smith recently debuted the Lazer 900 at the Consumer Electronics Show in Las Vegas and has contracts with major college programs including Kentucky, UCLA and Michigan State, along with a handful of NBA teams. Smith’s ambitions for the company are picking up momentum, but the journey to this point didn’t come without its share of roadblocks. Whether it was candy, a shoe idea he sent to Nike or hip-hop greeting cards, Smith’s ideas had promise but never found their footing. That was until he got to Mountain Pointe high school and capitalized on his hairstyle. Much to Smith’s surprise, it turned out the button was working the whole time. About a month later, two giant boxes worth of free grease showed up at his front door. Smith’s mom, naturally, saw the boxes as a major inconvenience. He saw them as a business venture. While Smith has an enduring entrepreneurial spirit, basketball has always been an integral part of his life. Those two passions crossed over when his basketball career came to a close after stops at Scottsdale Community College and Texas Southern University. For months, Smith trained young basketball players in the East Valley, but he soon grew tired of the tedium. Almost three years went by before Smith sold his first machine to a team. He hadn’t heard back after repeated calls, messages and emails to University of Arizona, so he decided to hop in his wife’s car and make the trek down to Tucson. When he got there, the man at the front desk brushed Smith off and told him that he needed to leave. But Smith kept at it, begging for 10 minutes of the equipment team’s time until finally they caved and brought him down to the practice court. Smith’s persistence led to over a dozen college programs buying the machine, and in May he will present it to the NBA combine to use the machine as an aptitude test for players trying to make the jump to the pros. Smith said he’s hoping the NBA is willing to take a risk on him and continue innovating as it has in so many areas. But not everyone—players and coaches alike—is all in on Smith’s idea. Coaches are often set in their ways and want to stick to old-school drills, and players are afraid of being embarrassed by how challenging the machine is. Among the NBA players that have used the Lazer 900, Stephen Curry mastered it, while others like Carmelo Anthony struggled and quit. Teams and players that use it have to put egos and tradition by the wayside, according to Smith. “Right now, it’s like the pool at the hotel,” Smith said. “It seems like fun, but some people are reluctant because they’re uncomfortable or they don’t know how. In the business world, Smith hopes to separate himself and leave a legacy on the game of basketball. He just needs a shot.